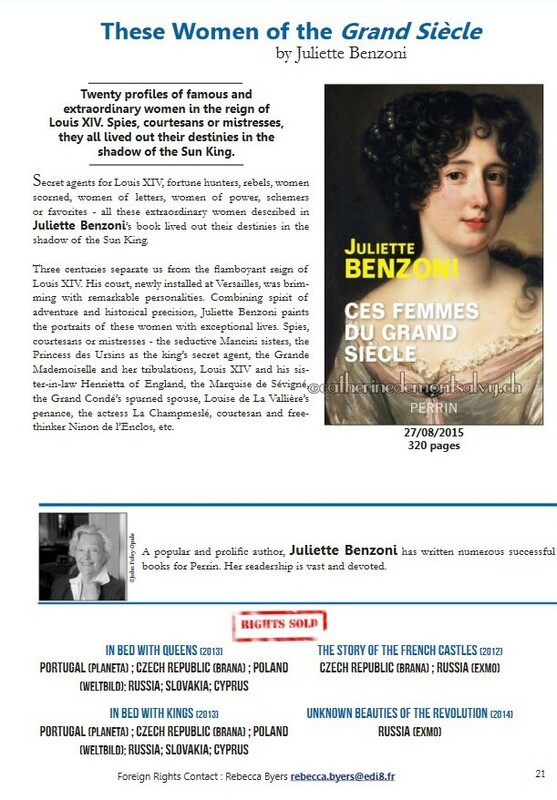 I hereby confirm that most of these rare over 50 year old articles and photos you see on the Press pages and all over this website - concerning Juliette Benzoni, belonged to the author Juliette herself. Be that newspaper articles or photos. She trusted me with her material to do whatever I thought was best. No infringement is intented. All information and material on this site are not for sale nor are services being paid for. First publication in 1966 by Heinemann Ltd ! The third book in Juliette Benzoni’s classic series of historical romances, back in print in the English language for the first time in decades - and including a lengthy section of text omitted from all previous English translations! I cannot express enough my pleasure to read this announcement - and to know that thanks to Telos Publishing, all English readers will be able to read finally all of the omitted text in BELLE CATHERINE by the previous publishers... I admit that when I first noticed the missing texts/pages, I got angry and felt betrayed! Nowadays a publisher would not get away with this anymore! 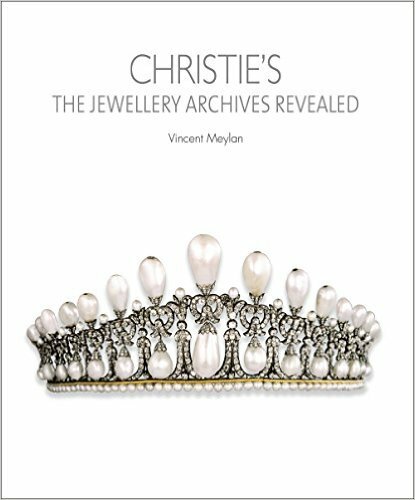 Well-known French journalist, historian and writer Vincent Meylan, of such exclusive books as « Queen's Jewels » or « Christies: The Jewellery Archives revealed » had been a close friend of Juliette Benzoni. Writing so many articles about Juliette and her books has been one of the great pleasures of my life. I was 15 when I discovered her books and they have never left me since. Point de Vue is paying its respects to Juliette next Wednesday in an article that I have written. I hope you will recognize yourself in it. The best definition I could give of Juliette is very simple: She just had an amazing talent. Being one of the very few journalists who has followed her during so many years, I think I can say this. The articles that other journalists could, and should have, written during all these years, would never have been so intense and affectionate, than what I have read on your Facebook pages and websites since the beginning of this week. It is you Linda, and all the readers of Juliette in the world who have written the best articles about her. You have read her and loved her. Nothing else matters. Je vous embrasse and I hope we are able to meet one day soon. To talk about Juliette again and again. Amongst others, Vincent Meylan has done my friend Frédérique and myself the great honour to mention us in the article calling us Juliette's greatest fans. After Juliette's funeral he invited us for lunch in Paris where we were able to talk as long as we liked about our great idol Juliette. The article is in French and has not yet been translated by this webmaster. After the death of Juliette on 7 February 1916, French Television honoured the worldwide famous Queen of History books, in the Transmission : "La Grande Librairie" on France 5 « Des auteurs face à leurs lecteurs ». 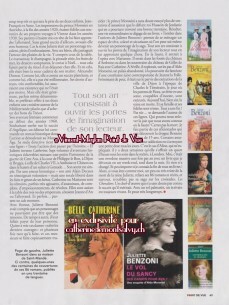 The extract they used was from 28 July 1978 - it shows the author Juliette Benzoni on television in Aujourd'hui Madame. I like to say openly thank you so much to our dear friend Claudine Ancelot, the actress who played Catherine de Montsalvy, for surprising us after Juliette's funeral with that extract. Overlooked by the critics, loved by the public, Juliette Benzoni, Queen of the historical Novels in France. To my great satisfaction after my call to the well-known Swiss Newspaper Tages-Anzeiger in Zürich to inform them of the passing away of the acclaimed French author Juliette Benzoni, Tages Anzeiger wrote the next day a very nice article. 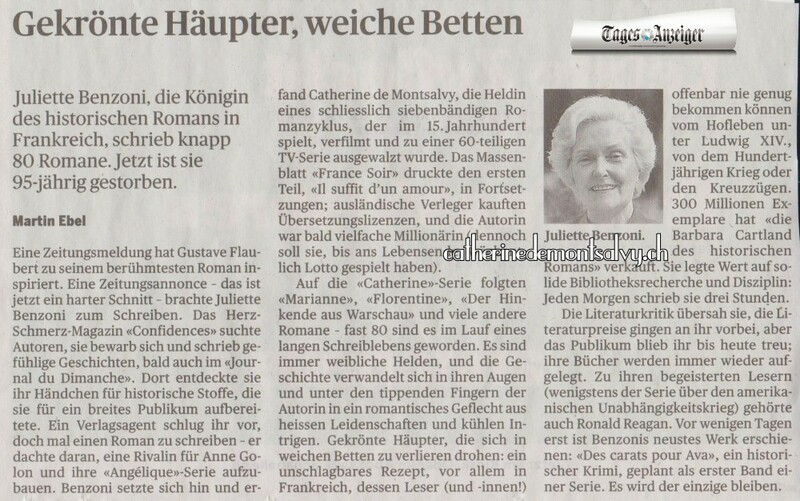 I like to mention that Juliette Benzoni's Catherine Novels (7), the Marianne Novels (6), The Lure of the Falcon (4), The Florentine Novels (4), Jean de la Nuit Series ( 3) and many more of Juliette's 86 books, were translated in German speaking countries like Switzerland, Germany and Austria. 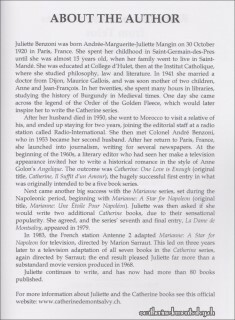 When Telos Publishing contacted me in January 2014 with their hopes, nobody in the world could be happier than myself that at long last an English publisher wanted to bring all seven of the Catherine de Montsalvy novels to a fresh audience after more than forty years. For many years I had written letters worldwide, begging for that seventh novel La Dame de Montsalvy to be published in English – and out of the blue came an email from Telos. Juliette was absolutely delighted, of course, and set me the task of being her « go-between » until the contract was signed. I am so thrilled that Telos are working on new translations so that the full French texts will be in their new English editions in both print and ebook formats. Telos Publishing's Press release for the rei-ssuing of the first two Catherine books back in 2015. So far this splendid book who offers 20 profiles of famous and extraordinary women in the reign of Sun-King Louis XIV has not been translated ! Juliette Benzoni shows once more her immense talent to make you believe the author knew these historic characters personally. A lecture you can with you on a holiday, long train trip and you will be entertained for hours. Every week this summer, the adventure of a successful writer acclaimed by the public, away from the media attention. Today, the Doyenne of historical novels. To this day, Juliette Benzoni has just put an end to her latest novel. Like with all her books, it took her seven months to write it. "The first month, I prepare myself and do researches. Then I write", she explains. For years, she ran to libraries in search of anecdotes and adventures to tell. Now, it is Anne, her daughter, who does the research on internet and corrects her manuscripts. Very rigorous, the novelist forces herself upon a strict schedule to which she always stands up to. Every morning she sits down in front of her old typewriter for three hours. No draft, just a plan. The characters, dates, colors: everything is in her head. The rest of her day is mostly spent in reading. She loves English thrillers and historical novels - those of Agatha Christie, Ellis Peters, Anne Perry and Ken Follett – she appreciates Eric Emmanuel Schmitt and Marc Levy, but "is not fond" of Proust. "I like him and I do not like him at the same time, she said. He’s a bit boring! 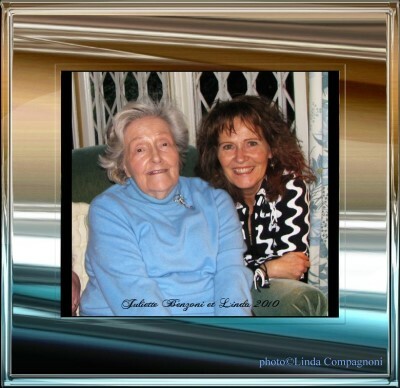 "She watches a bit television, especially the Mass every Sunday, and does a crossword puzzle to train her memory. She often receives visits in her house at Saint-Mandé. Friends and neighbors come to share little cakes and drink coffee - "the one of George Clooney!” she specifies. At nearly 92 years, Juliette Benzoni is the Doyenne of historical novels. 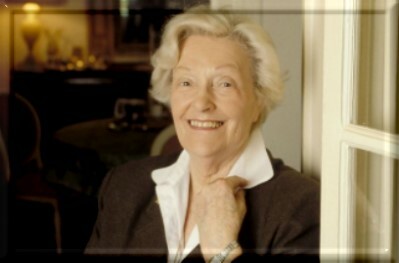 In her career of fifty years, she has written nearly 80 novels, "two every fourteen months," she indicates. Translated into twenty languages, her books have sold over 300 million. It is from her passion for History that Juliette Benzoni draws her energy. The novelist had "fallen into the pot" at the age of 9, discovering Jeanne of Arc in a guide. "It was a shock," she remembers. The reading of The Three Musketeers by Alexandre Dumas and Victor Hugo finally convinces her. The Italian Renaissance, the time of the Crusades, the Hundred Years War: every period of History inspires her frescoes in which Kings, Princesses, Duchesses and Knights love, betray, fight each other. Through the eye of beautiful heroines - Fiora, Hortense, and Sylvie - she leads her reader in the alcoves of castles and in gilded palaces, bringing back to life, through the pages, Cardinal Richelieu, Louis XIV, Marie Antoinette and Charles X. However, she never writes beyond the 1930’s. "This is a time I lived in and which does not appeal to me. I do not want to talk about the War"; she explains. Despite of the enthusiasm caused by most of her books, the media have dedicated her only small attention. "I was not much solicited. But I had all the same from time to time the honor of the magazine Figaro Littéraire ! she says. I have been immediately classified as a "Popular Novelist". It has long exasperated me. If this means that one is well read, all right. But if that means it is more or less sloppy writing … it annoys her. Whatever, it is first of all for her readers that Juliette Benzoni writes. Her ambition? "To entertain, while at the same time impart something to them." The thought that she may disappoint them, haunts her at each new novel. "I am always also afraid. I hope it will go well but I'm not sure. “she says. "She always worries. “ confirms her daughter. "Writing means a lot of sleepless nights," says the novelist. But it is also a great way to escape, which let her for a while turn away from the tragedy that changed her life: the sudden death of her son, Jean-Francois, nearly twenty years ago. Today, the letters of her admirers are her greatest reward. "What I enjoy the most is when someone tells me, he or she was sick, at the hospital and that my book makes them feel good," she says. But the most illustrious letter she had ever received is the one in the 1980s by a man named Ronald Reagan. The President of the United States and his wife, Nancy, were thanking her for her description of the Independence War in “Le Gerfaut” (The Lure of the Falcon), book series of four volumes published from 1976 to 1981, by Trevise Publisher. It is also for that kind of surprises that Juliette Benzoni still signs white pages. And she hopes to go on, "as God lends her life." I like to introduce with this article Venetian Prince Aldo Morosini, expert on precious historic stones. Unfortunately the Aldo Morosini adventure's have so far never been translated into English. In my own opinion, a real loss for the English speaking readers and of course also for the Italian's and German readers! Juliette had absolutely adored this dashing hero. Actually she was asked by a famous French actor at the beginning of the Nineties (television, Cinema and Theater) to write for him a script for a four-part television Series. Alas, the producer for this show died and afterwards it was never talked about it again. As Juliette told us it was said that the costs for this Series would have been too much for televison...! Aldo Morosini, on his fathers side Venetian - from his mother French, a great combination indeed as the reader will find out. After Aldo Morosini returns from WWI his family is ruined and he needs to find an occupation for his living. He refuses to marry a rich Swiss girl, and rather goes to work. In his Palace in Venice there are many priceless objects and he can start his own business as antiquarian. Love, friendship, betrayal, murder, we find everything in these superbly written books. On his researches Aldo travels to Paris, London, Warsaw, Vienna, Sevilla, Praque, Zürich, Jerusalem, Cairo, Romania, Germany ect.. and even crosses the ocean to go to America! Juliette has created an hero which is appreciated not just by women but also men ! Juliette Benzoni, a hard-working nostalgic. 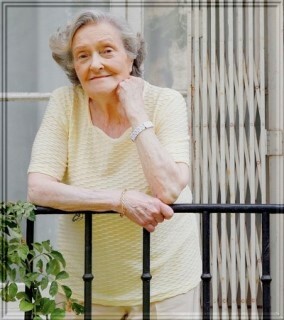 At 90 years old, Juliette Benzoni published a collection of short stories and a novel. This passionate of History, is also a frantic worker. And even two! Nothing can stop Juliette Benzoni, 90 springs, who has just published two books simultaneously: a collection of short-stories edited by Perrin (”Dans le lits des Reines : Les amants“) and a new novel edited by Plon (La Chimère d'or des Borgia), all in all, over 760 pages. The Dean of historical novel has an untamed rhythm after nearly fifty years. Her recipe? Passion and work! At precisely 7:45 AM, she sits every day, in front of her desk at her home in Saint-Mandé (Val-de-Marne). 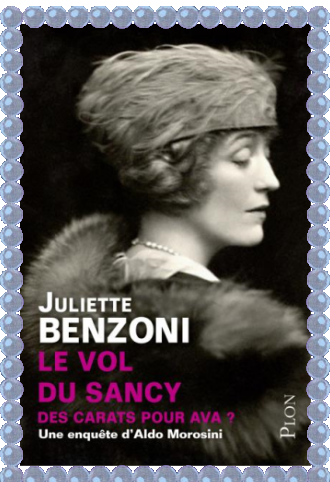 Less appreciated by the media, but popular with the public (she has sold over 100 million copies worldwide of her complete works, which include around 80 titles), Juliette Benzoni, great admirer of Dumas, has abandoned long ago the “Fifth Republic” to live in the past centuries. 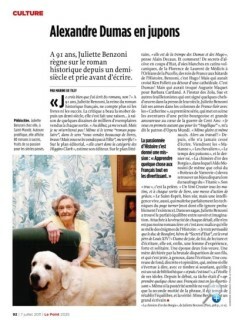 At 91 years old, Juliette Benzoni rules over historical novels since half a century and prays before writing. « I think that I have written around 80 books, haven’t I? 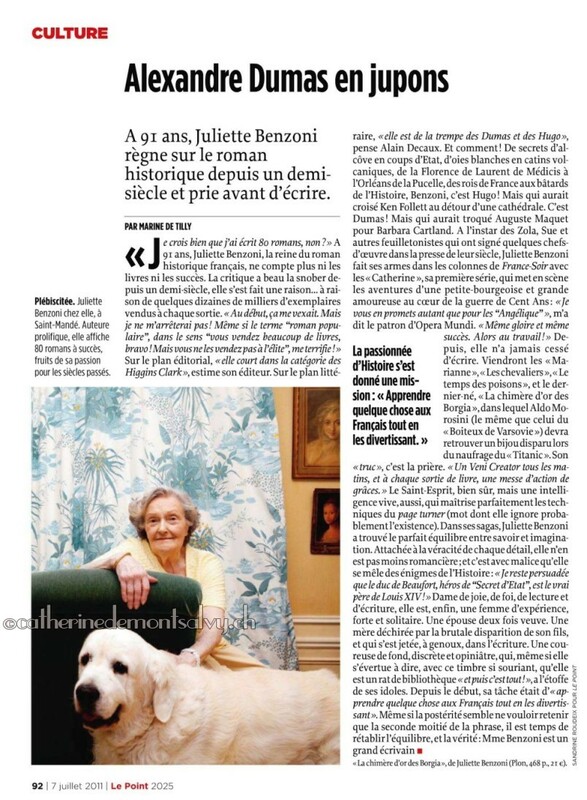 » At 91 years old, Juliette Benzoni, the Queen of French historical novel, does not count the books anymore, neither the success. Criticism may well snub her for half a century; she resigned herself… at the rate of tens of thousands of copies, sold after each new publication. “At first, I was upset, but I did not stop! Even if the term of “popular novel” in the sense of “you sell many books, bravo, well done, but you don't sell them to the elite” terrified me!” On editorial terms, “she runs in the category of Higgins Clark” says her publisher. On the literary, “she is in the league of Dumas and Hugo”, says Alain Decaux (famous French historian). You bet she is! From secrets in the alcove, to coups of the State, from innocent young maidens to volcanic whores, from Florence of Lorenzo de Medici to Orleans of the Maid (Joan of Arc), to the Kings of France to the Bastards of History, Benzoni, this is Hugo! The passionate of History gave herself a mission: Teach some things to the French people, while entertaining them at the same time. After that, she has never stopped writing. 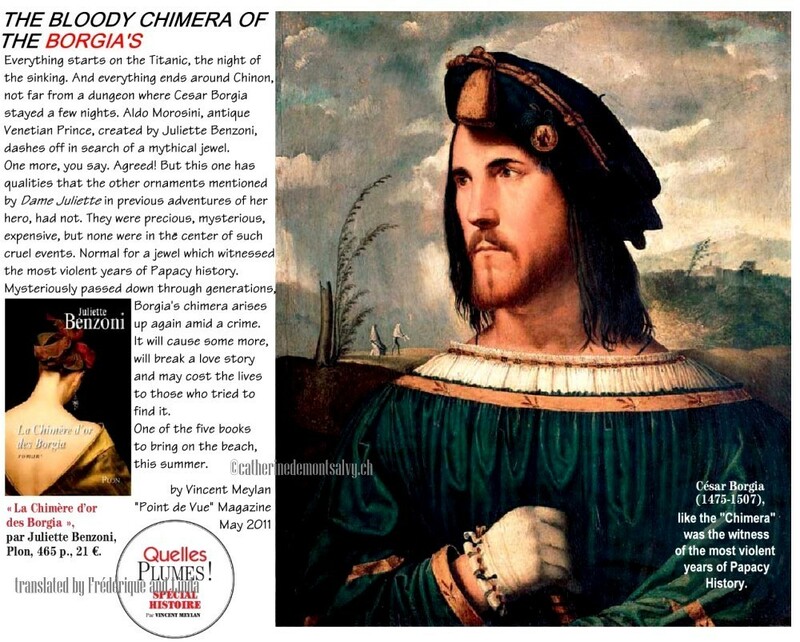 There followed the book series “Marianne“, “Les Chevaliers“, “Le Temps des Poisons” and the latest one “La chimère d'or des Borgia” where Aldo Morosini (the same hero from “Le Boiteux de Varsovie“) will have to search for a jewel lost during the sinking of the “Titanic”. Her “device“, is to pray.” One “Veni Creator” every morning, and at each book release, a mass of thanksgiving. The Holy Spirit, surely, but also a lively intelligence who knows perfectly the “page turner” techniques (a word which she probably does not even know exists). In her sagas, Juliette Benzoni has found the perfect balance between knowledge and imagination. Attached to the veracity of each detail, she is nonetheless a novelist; and she gets involved with malice in the puzzles of History: “I remain convinced that the Duke of Beaufort, her hero in “Secret d'Etat”, is the real father of Louis XIV! “. A woman of joy, of faith, of reading and writing, she is also a woman of experience, strong and solitary. A wife twice widowed. A mother, torn apart by the sudden death of her son, who has thrown herself on her knees in writing. A distant woman runner, discreet and persistent, who, even she strives to say, with her so timbre smiling tone, that she is a bookworm “and “that's all!” – who has the stuff to make her idols. After her debut, her task was to “Teach some things to the French people, while entertaining them at the same time. “. Even though posterity seems to want to retain only the second half of the sentence, it is time to restore the balance and the truth: Mrs. Benzoni is a great writer. Linda : Bonjour dearest Juliette, what was your first reaction, when you received Frédérique’s and mine letter? 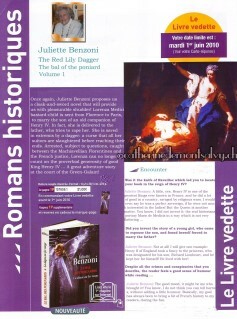 Learning that there existed fan sites about Juliette Benzoni? Juliette Benzoni : I was delighted, of course! I already knew that I had many readers around the world, otherwise why would they have taken the pains to translate me into…. I do not know any more exactly, how many languages, but that someone takes pains to be interested in me that was new. I wanted to meet you and I discovered then truly friends. It was wonderful! And I believe that I shall never be able to thank you enough. Juliette Benzoni : This question duplicates a bit the previous one. My publishers always informed me and also those of my friends, who while traveling around the world, sent me photos of bookshops from Peking, New York or elsewhere. The letters I received did also inform me, but not as much as you do. I am not – yet – connected with Internet! Linda : As we know from older interviews, you were absolutely not happy the way “Catherine” was filmed in 1968. What made you change your mind to be on board for the TV production in 1985? Juliette Benzoni : I think that I have never cried so much in my life - about something of my natural work! – By watching this movie in the Studios of Boulogne. It was everything but my story. As we were in 1968, the screenwriter had kept only one thing: that it took place in Paris during an University riot! From this, my hero Arnaud de Montsalvy had become a student from the Parisian riot - instead a captain of Charles VII! - Then leader of a band of brigands in the forest of Fontainebleau and so on … A horror! I wanted to remove my name from the credits. The result: the German and Italian co-producers refused to pay. The movie was able to be seen only one week, instead of a month, before being banned by a law decision, but that did not prevent it to have a small success in the Middle East. After ten years, it even made a furtive appearance on television. I have a copy which I owe to the kindness of Henri-Jean Servat. Quite different was the TV adaptation, which gave me a lot of joy. Designated by my friend Henri Spade - one of the greatest figures on TV, nowadays departed, I was able to see my story come to life in front of me – like I was afore able to watch MARIANNE come alive, played by the young debutante Corinne Touzet! - my characters - thanks to Marion Sarraut's talent, the tireless director, and to the young comedians with whom she liked to work with : Pierre-Marie ESCOURROU, Claudine ANCELOT, Gérard CHAMBRE, Benoist BRIONNE, Pierre DENY, Philippe NAHON, Philippe CAROIT, Christian RAUTH and those just a bit less younger, Pascale PETIT, Dora DOLL, Jean-François PORON and the irresistible Philippe CLAY! Without forgetting the superb Queen Yolande, who Geneviève CASILE of the “Comédie Française” was willingly to incarnate, Georges MONTILLIER as bishop Cauchon larger than life, Marthe MERCADIER and Isabelle GUIARD who was a touching Jeanne d’Arc! As for the adaptation I was all the more delighted to participate in it, when I learnt that it was under the guidance of Jean CHATENET, one of the very best who became a friend! It was fascinating! I admit that I have spent with this merry gang, some of the best moments of my life and that I still bear for them friendship and gratitude and evidently also for those of Le Gerfaut (The Lure of the Falcon) and La Florentine (Fiora)! Linda : Do you have any special fond memories, be it amusing, hilarious or even disastrous from the filming of “Marianne, Catherine, Le Gerfaut and Fiora, the Florentine? Linda : Now many years have gone by, since “Catherine” your first big success was published in 1962. 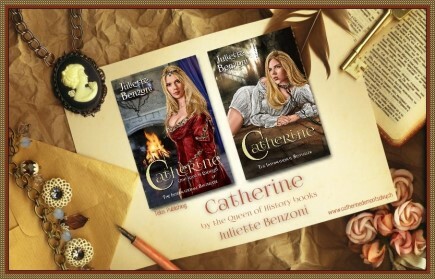 In your own opinion, what could have been the reason that “Catherine” will always stand out as the BOOK of Juliette Benzoni, even though you have written so many other Bestsellers? 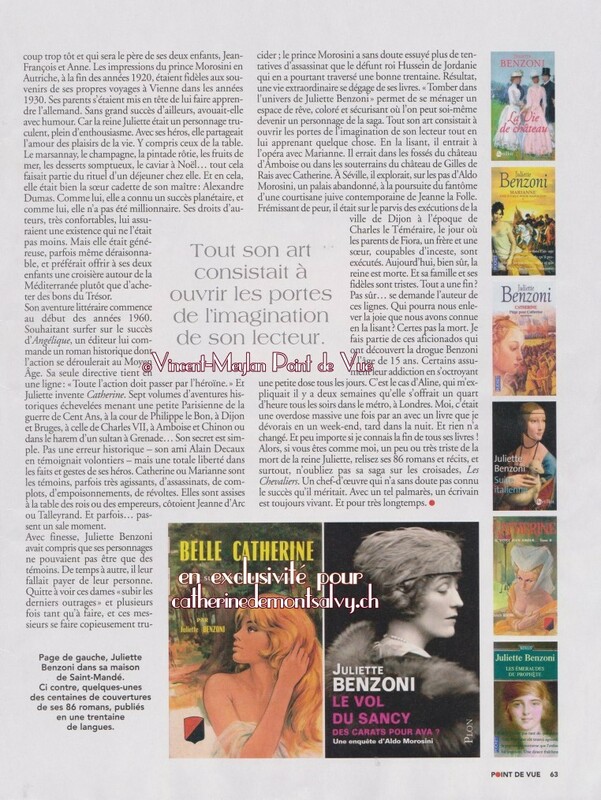 Juliette Benzoni : Maybe because it was not only the first success but also the very first of my novels and also the longest: seven books while Marianne (Marianne, the bride of Selton Hall) has six and then I exceeded the number 4 only for Le Boiteux de Varsovie (15 adventures 5). 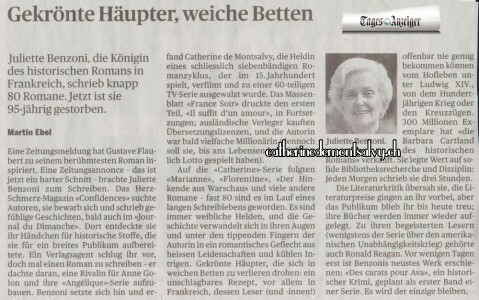 I believe however that, thanks to the TV series, Le Gerfaut made up to Catherine. I even own it a lovable letter from Ronald REAGAN, then President of the United States and his wife Nancy because of my description of the War of Independence! Linda : In your book series you chose always a different century. Will you reveal to us, what made you choose the time-period for each new novel? Juliette Benzoni : I do not choose a different period, I choose according to the story I wish to tell, with a preference for the Middle Ages: CATHERINE, UN AUSSI LONG CHEMIN, Les CHEVALIERS, DE DEUX ROSES L’UNE, the same with LA FLORENTINE which is however close to the Renaissance period. There were special characters who had always tempted me: Jeanne d’Arc, the sublime leper King, Baudouin IV of Jerusalem, Duke Beaufort, and Baron de Batz, all of whom I have now written about. Now it works on a heartbeat. But, before writing, I always need a very long time on research. At present, I confess to having a deep pleasure to write the Morosini series with its famed murderous jewels. Linda : You have now so far, written seventy-six books (and as we know, you are very busy at the moment with the sequel to “La dague au lys rouge” Is there one character, female or male you would love above all, to write still about and will you reveal it to us? 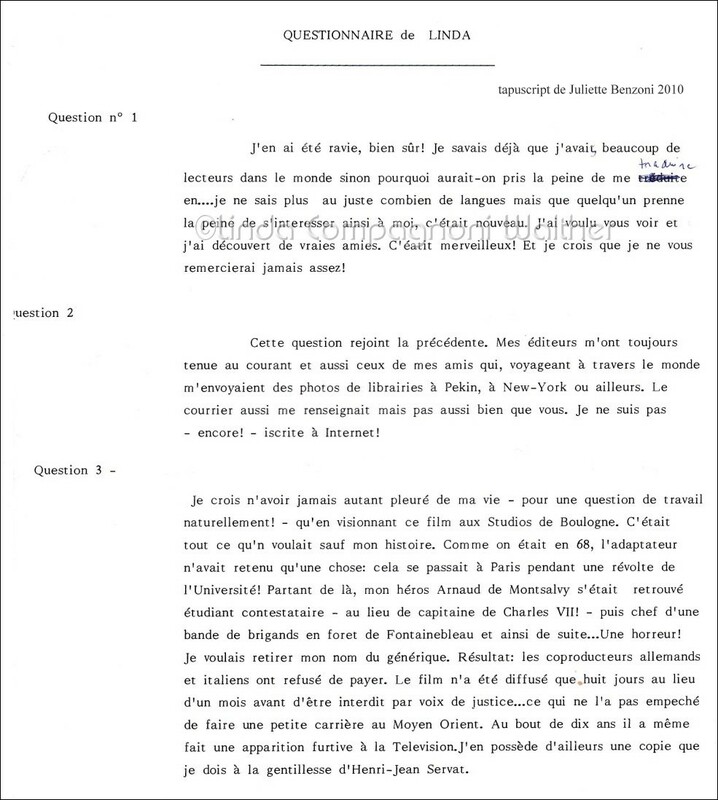 Juliette Benzoni : This question duplicates the precedent one but it is true that, I had to give up a continuation to Le GERFAUT (*), I sometimes dream about an eighth book for CATHERINE. If that is what God wants! Linda: As we know, your latest bestseller is called“ La dague au lys rouge” . Can we expect that it will be translated also in other foreign languages, like English, Spanish, Italian and German? Juliette Benzoni : I know nothing about it. And neither does my publisher for that matter! Linda: Exists there still one historical character, you always wanted to write a book about, but there was never the right moment? Juliette Benzoni : I do not see one. Linda : Is there one question you have never been asked, and would have loved to answer? Juliette Benzoni : No. On the other hand, there is one that I am asked with a great regularity: " From where do you get all this? “ Then, one more time: from my passion of History and the joy to write! Linda : What advice can you give to an unknown author, who wishes to write historical books like you have done in the past and still do? Juliette Benzoni : Foremost a solid preparation. It is necessary to study the epoch, the real characters, to make a chronology, to study the lifestyles, the fashions itself, everything which can enrich and give a veracity. It demands a lot of time and a lot of work. That is why you need above all to be passionate. After that, you can let the imaginary characters live their life as they want… or as they can! Linda : If you had a wish free, which of the fictive characters you created so far, or which personality would you like to be for a day? Juliette Benzoni : Without doubts the Marquise de Sommières, for the pleasure to live among people completely according to my heart. I would love to have Aldo Morosini as a nephew! 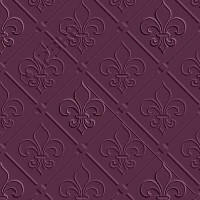 Maybe also the cardinal of Richelieu: to see the effect of having the supreme power! But only for twenty four hours! (*) : Juliette Benzoni had already told us, that there could not have been a continuation for Le Gerfaut,(The Lure of the Falcon - but careful, Heinemann only translated 2 out 4 books! ) because the character would have had the same fate as Baron de Batz whose history she writes in Le Jeu de l’Amour et de l’Amour : who tried everything to save Louis XVI, Queen Marie-Antoinette and the Dauphin. I would like to thank my dearest friend Juliette from the bottom of my heart. 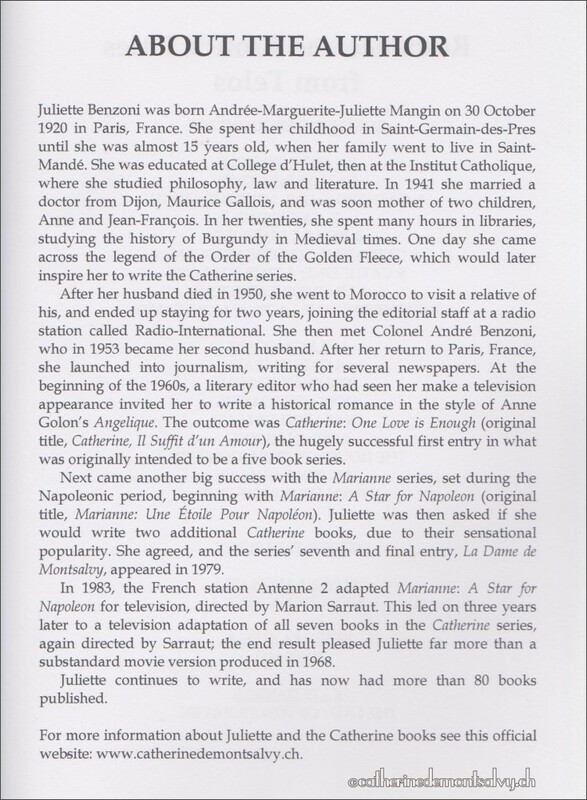 Not in my wildest dreams would I have thought that I should one day be able to interview my most beloved author Juliette Benzoni, who wrote my Catherine Novels, the one book series I was never able to forget for over forty years ! Juliette you are so adorable, please never stop writing. Thank you for the beautiful friendship you have offered me right from the beginning of our meeting. I bow before you and your talent, your energy, your willpower. You are the most phenomenal and outstanding woman I have ever met so far in my life. 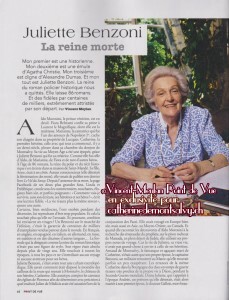 A special thank you to dear Frédérique, who encouraged me in 2010 to ask Juliette for this interview. She is an orphan. She was raised in a convent. She is the heiress to a great fortune and the ward of the Queen of France, Marie de Medici. In 2010 Juliette Benzoni introduced us readers to a new heroine with the name of Lorenza Davanzati, who was sent from Florence to Paris to marry the son of an old compagnion of King Henry IV. It is truly a great adventure story where Juliette once again makes us forget time and space to know what will happen with this new adorable heroine. Unfortunately this series has so far not been translated into English. This was one of the books my dear friend Juliette was working on during our beautiful friendship. I remember how we tried to coax Juliette to tell us with whom Lorenzina would end up ! She had smiled at us and said: " I do not know yet.. my characters do not always do what I had in mind for them in the beginning..."